Harry Doyle smiled as he released the carrier pigeon into the evening sky, reinforcements were on there way, after the recent set back at Park Royal the Leader of the Severn Riverside Wharf Labours Federation had received word that a flying column of Gloucester dockers were on route via upton. Was the tide turning in favour of the forces of the left.? 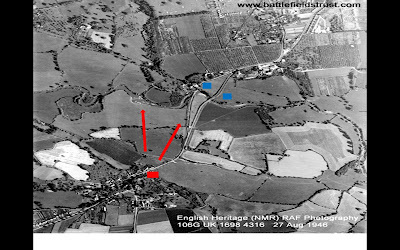 The plan was a simple one seize the Bridge at Powick opening up access to the city from the West. 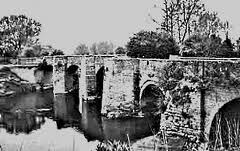 The main road bridge was well defended but the old Bridge of the1st civil war fame, was less so with only a single bunker guarding the approach, the Socialists were also made aware by a local angler of a crossing at the weir and salmon tanks, which had been over looked by the Fascists, allowing the dockers to cross the Teme to flank the BUF positions. Top Left the Old Powick Bridge and Power station, the Weir crossing can be seen to the right. Dawn on the 7th under the cover of a low lying mist to protect them from the defenders of the road bridge the dockers advance on a board front pushing down the road to Powick Bridge and across ham hill towards the River Teme. We used the Too Fat Lardies Mud & Blood Rules, with a couple of card tweaks to add to the 1938 flavour, The BUF defenders were forced to start within 10inches of the Power Station and Bridge, all BUF defenders started the game on blinds or hidden in the terrain. The dockers must exit the bulk of their forces off the southern table edge. Opening moves and the BUF push forward their armoured car to cover the bridge and the approaches to the the Bridge from the Malvern Road. The dockers enter the table to armoured cars and several sections of infantry, the Socialist opt not to enter on blinds to give them the opportunity to fire on to the bridge defenders. A Fascist blind rushes to the weir realizing that they have left their flank exposed, socialist blinks can be seen in the background sweeping down from Ham Hill. The dockers reach the Vernon Arms (a wool shop in this encounter) and skirt around the rear to avoid the harassing fire from the BUF pill box, meanwhile a good turn of cards has pushed a second section into the enclosures to the right of the Pill box. At the Weir the Socialist blinds cross the river, whilst a BUF Blind takes up a postion in the meadow covering the crossing. The end of the turn and both players unmask, the BUF are significantly outnumbered armed only with rifles and close assault weapons, whilst the docks have several lewis guns in their armoury. The BUF and local Police rush to support the weir defenders knowing that the power station and bridge will compromised if they cannot hold the right flank. Despite the BUF card coming up first the rifle fire is insufficient to stop the advancing dockers, they move forward and close assault the BUF defenders, despite the fact they held the hedge row, the SMG and pistol armed dockers inflicted sufficient casualties to drive the BUF from the field leaving their Big Man mortally wounded in the mud. Meanwhile at the bridge the Socialist made their play, bursting from the hedgerow they charged into the BUF defenders who were unable to bring sufficent firepower to bear, unable to retreat the shell shocked defenders surrendered to the forces of the left. Playing an heroic leader card the fired up communists charged across the bridge hand grenades primed. The dockers inflicted sufficient hits on the vehicle to force the crew to bail and flee the table. The BUF commander attempted to rally the fleeing section in front of the power station but was set upon by the advancing dockers a further fire fight ensued forcing to the BUF to head for the realative safety of the Powick power station. The BUF on the run, their would be some dark nights in Worcester in the coming weeks unless the government forces to recapture the power station…. A great nights gaming with plenty to keep both sides busy…….. Played in under 3 hours although we could have played for longer if the militia had turned up for the far right.